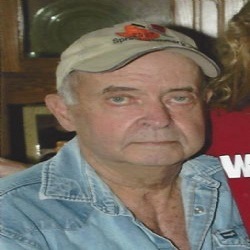 Orvis Lamar Martin, age 68, of Hatfield, died Saturday, December 1, 2018 at his home. He was born on Tuesday, August 15, 1950 to Orvis Elmo and Ruby Cleo Almonrode Martin in Mena, Arkansas. Orvis served his country in the National Guard from 1969 to 1974 and then soon started a 34 year career working for Weyerhaeuser in Wickes. He was a great provider for his family and loved them dearly. Orvis loved to go deer hunting and was president of the Slate Creek Hunting Club. He and his wife, Linda attended Zafra Church of Christ. Orvis was a loving husband, father, grandfather, uncle and will be missed by all who knew him. He is preceded in death by his parents; his two brothers, Rex Martin and Roy Martin, and one granddaughter, Madison Martin. Orvis is survived by his loving wife of 48 years, Linda Martin of Hatfield; his son and daughter in law, Scott and Brandy Martin of Mena; his two daughters and son in law, Wendy Martin of Hatfield and Sondra and Jonathan Rosson of Mena; four grandchildren, Mason Martin, Kody Martin, Kensey Rosson and Kaison Rosson all of Mena; several nieces and nephews and a host of other relatives and friends. Graveside services will be Wednesday, December 5, 2018 at 2:00 P.M. at the Six Mile Cemetery in Hatfield with Brother Donnie Jewell officiating. Visitation will be Tuesday, December 4, 2018 from 6-8 P.M. at the Bowser Family Funeral Home Chapel. Services are entrusted to Bowser Family Funeral Home in Mena. Pallbearers are Laydel Risenhoover, Jon Bagley, Jock Owens, Mike Dunn, Danny Davis and JR Hicks. Honorary Pallbearers will be members of the Slate Creek Hunting Club.